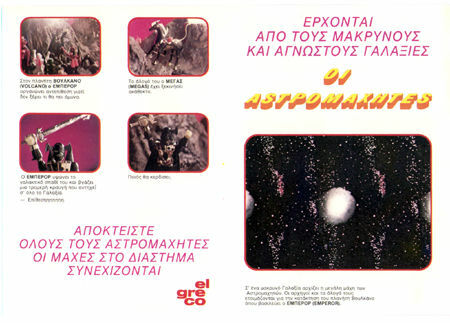 Below is the catalog/story that came with the Greek Astrowarriors. The text was translated by Leon Barber, to whom we owe great thanks! Thanks Leon! The translation starts with the right half of the first image below and then moves on into the interior pages and then back to the left half of the first image. Start below, then go to the next panels below before returning to the text at left to finish the story. On the planet Volcano, The Emperor organizes a counterattack since he doesn't know the meaning of defense. His horse Megas has set out unchecked. The Emperor raises his galactic sword and lets loose a terrible scream, which resounds across the Galaxy. From a distant galaxy begins the great war of the Astrowarriors. The leaders and their steeds are preparing for the conquest of the planet Volcano, where the Emperor reigns. 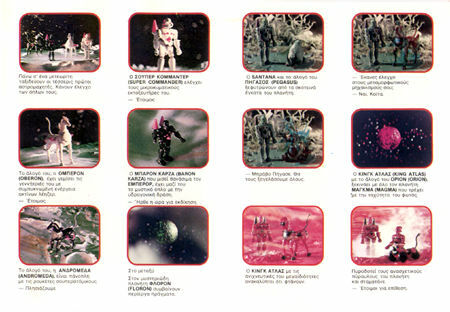 Traveling upon a meteorite are the first four Astrowarriors. They are checking their weapons. Super Commander is checking his microwave projector. His horse, Oberon, has filled his generators with the dense energy of laser beams. Baron Karza, who has a deadly hate for the Emperor, has the mystical weapon with hydrogen action. "The time has come for vengeance". His horse, Andromeda, has a panoply of superatomic rockets. Meanwhile, at the mysterious planet Floron, strange things are happening. Santana and his horse Pegasus sprout from the dark depths of the planet. "Did you check your metamorphosing mechanism"? Bravo Pegasus. We're going to deceive them all. King Atlas, with his horse Orion, sets out with the entire planet Magma, which travels at the speed of light. King Atlas with his mega tracking ability discovers that they're arriving. He throws flame at the planet's defensive missiles, and they stop.